A friend was in town from Canada today and I gave her a tour of the garment district. Knowing that I will be shopping again soon (fyi, there’s a NYC PR Shopping day on August 28th, check it out! ), I was very frugal. Honest! I only bought two fabrics, invisible zippers and a separating zipper for Karen. Oh and I got a twin stretch needle! Yippee! For some reason, my pc ate my picture of the stretch cotton chambray I bought and I’m too lazy to take it and download it again (my pc is really old and crotchety, just like me). This will be used for my first iteration of Butterick 5147. I finished the second muslin last night and I love it! Now I just have to decide if I want to use cotton batiste as the lining or not since I want to be able to wash this dress and not dry clean it. Hmmm…. Game time decision I think. The second fabric I bought I almost didn’t buy. It was a little on the expensive side for me at $18/yd, but the cutter game me $2 off per yard, so it was definitely worth it in the end. It’s a silk twill border print. It just spoke to me right away. I am really into silk twills lately. I just love the hand, the feel, and the drape. What’s not to like about silk though right? But enough of the wordy stuff… Here’s the picture of my latest beautiful fabric. I would love to be part of the NYC PR shopping day. It looks like I will be in New York and it would be great to be with people who know their way around. Love that fabric. If you’re old and crotchety, what does that make me? Please, please, please DO NOT line it in cotton batiste if you want to wear anything under it. The cotton will cause a friction and rub the wrong way. Use something silky like a rayon bemberg, rayon lining or a china silk lining which will work better with the fashion fabric. I only use cotton batiste to underline, not to line any more. Love the fabric. Enjoy it! Gorgeous fabric. I agree with Carolyn, use something silky as a lining. Accidental purchase! I doubt that. I think it jumped into your arms on purpose! Oooh–beautiful fabric. I can see why you had to get it. I’m curious about your twin stretch needle. To my great frustration, two different fabric stores told me there is no such thing. What is the manufacturer and the identifying information please, and what store did you find it in? Many thanks! That is a gorgeous piece of fabric. I can’t wait to see what you make with it. Oooh, I can see why you had to have that silk. It’s gorgeous! Hi Elizabeth – I’m back in London and now, of course, I’m wishing I was still shopping in the NYC garment district. 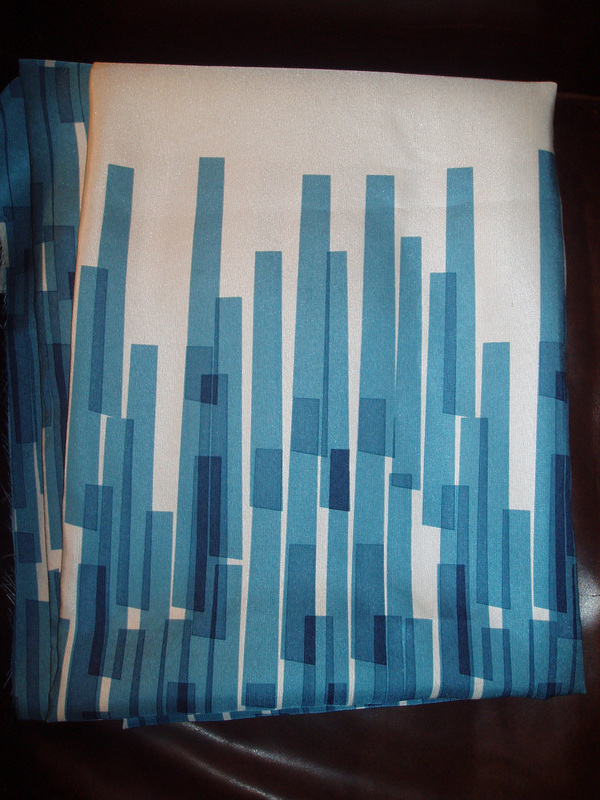 What a gorgeous piece of silk you have ‘accidentally’ chosen there – I love those shades of blue and the pattern is fab – it makes me think of an abstract of the NYC skyline! By the way, I did make it to Elliott Berman and made a couple of purchases there – how could I resist?